Jonathan Henry "Jon" Jay (born March 15, 1985) is an American professional baseball center fielder for the Chicago Cubs of Major League Baseball (MLB). He previously played in MLB for the St. Louis Cardinals and the San Diego Padres. A product of the University of Miami, he played college baseball for the Miami Hurricanes and was the Cardinals' second round selection in the 2006 MLB draft. He made his MLB debut for the Cardinals in 2010 after batting .301 with 34 home runs, .803 on-base plus slugging percentage and 61 stolen bases in 409 minor league games. The starting center fielder for four consecutive National League Championship Series (NLCS)-qualifying clubs as a Cardinal (2011−14), Jay was a World Series champion in 2011 as the Cardinals defeated the Texas Rangers. Between 2011 and 2013, he established an errorless record streak for NL center fielders at 245 games. He finished tenth in 2012 in the NL in both batting average and on-base percentage. After wrist injuries limited his effectiveness in 2015, the Cardinals traded Jay to the Padres. Active in the community, he has hosted celebrity bowling tournaments for charity. 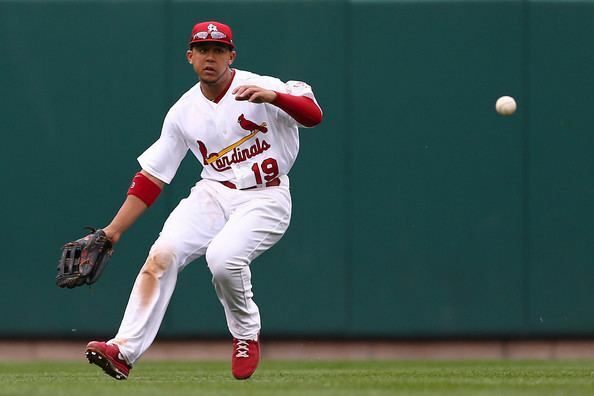 Jon Jay was born in Miami, Florida, and spent his youth there. He went to middle school at George Washington Carver Middle School, part of the Miami-Dade County Public Schools district, and attended Christopher Columbus High School, in Miami. Showing exceptional baseball skill in high school, Jay played on the state championship-winning team during his senior year in 2003. He then received a scholarship at the University of Miami (UM) and played for the Miami Hurricanes baseball team. During his three years at UM, he batted a combined .387 with 31 doubles, four triples, seven home runs (HR), and 108 runs batted in (RBI) in 120 games played. The Cardinals selected him from UM in the second round (74th overall) of the 2006 MLB draft. 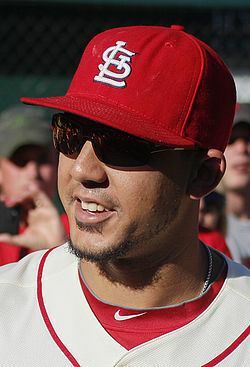 Jon Jay made his Major League debut on April 26, 2010 with the St. Louis Cardinals, after beginning his second consecutive season with the Memphis Redbirds. During his rookie season, he played in 105 games and made 323 plate appearances (PA), batting .300 with 19 doubles and a .359 on-base percentage (OBP). In the outfield, he played all three positions. Stationed mainly in right field, he collected five assists. 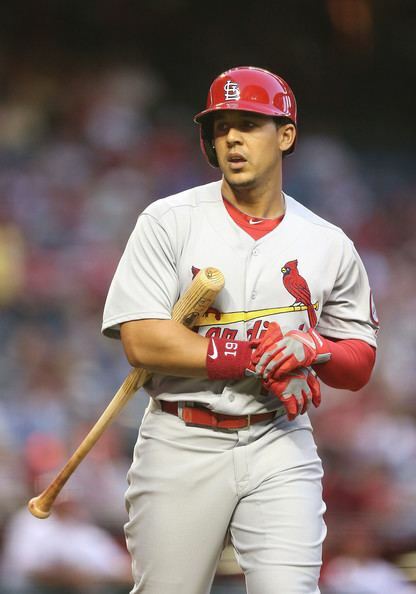 On July 27, 2011, the Cardinals traded starting center fielder Colby Rasmus to the Toronto Blue Jays, clearing the way for Jay to take over as the regular center fielder. That season, he led the team in games played (159) and batted .297 with a career-high 10 HR. In Game 6 of the 2011 World Series, Jay had a key hit in the 10th inning and later scored the tying run on a line drive into centerfield by Lance Berkman. On May 15, 2012, Jay was moved to the 15-day disabled list due to lingering shoulder soreness after running into the outfield wall the month before, but he returned shortly thereafter. For the year, he finished with career-bests in batting average (.305) and OBP (.373), both of which placed tenth in the National League (NL). His 19 stolen bases (SB) were another career best. He hit four HR, collected 40 RBI, 22 doubles and scored 70 runs. Between August 24, 2011 and July 30, 2013, Jay established a new NL all-time errorless streak record for center fielders at 245 games against the Pittsburgh Pirates. It is also the longest streak for all Cardinals outfielders. Curt Flood, a former Cardinal, owned the previous center field record of 226 games spanning from Sep 3, 1965 to Jun 2, 1967. With increased playing time in 2013, Jay established career-highs in PA (628), doubles (27), runs (75), and BB (52), and RBI (67). However, his batting average (.276) and SLG (.370) slumped to a career-lows. He was third among NL center fielders in games played (153), fourth in putouts (335), first in double plays (three), and second in fielding percentage (.997). Conversely, advanced defensive metrics showed he was ten runs below average for center fielders for defensive runs saved (DRS), ranking 32nd in MLB. From 2011–13, Fangraphs rated his arm at 21st out of 21 centerfielders who played at least 2,000 innings. Runners advanced for extra bases on Jay in 60 percent of plays. 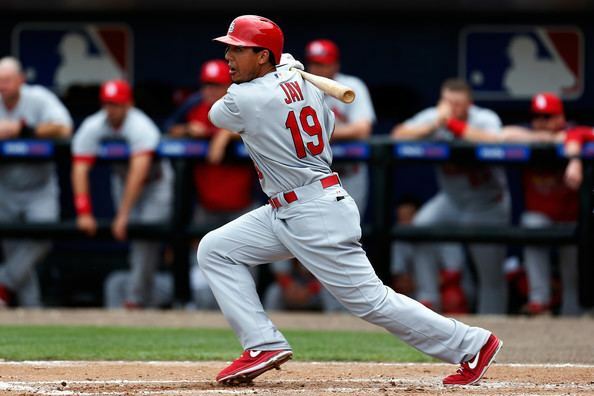 The Cardinals agreed with Jay on a one-year $3.25 million contract on January 17, 2014, to avoid arbitration. Through 2013, Jay had a career batting average of .300 with a .356 OBP and a .400 SLG. After the Cardinals acquired outfielder Peter Bourjos in a trade with the Los Angeles Angels of Anaheim during the offseason of 2013, Jay's role on the club was expected to be reduced during 2014. Bourjos' impressive defensive ability was one of the main reasons of the trade, as Jay's 2013 defensive campaign was probably the worst of his career. But after a poor offensive April for Bourjos, Jay's playing time started to increase throughout the season, as Bourjos found himself on the bench more and more. By the end of the season, Jay finished batting .303, with three home runs while driving in 46 runs. Although appearing in only 17 fewer games in 2014 than in 2013, Jay had 135 fewer at-bats, and could not contend for the batting title, where at one point in September he was batting well over .320, which was higher than the final .319 batting average of Justin Morneau, who won the batting title. During the postseason, where Jay had historically struggled throughout his career, he batted .478, going 14-29 throughout the NLDS and NLCS. In the off-season preceding the 2015 season, Jay had surgery on the left wrist, which did not heal completely. He struggled through other injuries on the same wrist, such as a bone bruise and tendinitis, hampering his ability to hit effectively. He missed a number of games in the month of May, and another 57 from July 1 to September 4. On December 8, 2015, Jay was traded to the San Diego Padres in exchange for Jedd Gyorko. After a productive first couple of months of the season for the Padres, Jay suffered a broken forearm on June 19 and was placed on the DL on June 28. He was reactivated on September 6th. On November 29, 2016, Jay signed a one-year, $8 million contract with the Chicago Cubs. On July 6, 2017, Jay pitched a scoreless 9th inning in an 11-2 defeat against the Milwaukee Brewers. At various times, he has been nicknamed "The Federalist", "The Founding Father", and "The Chief Justice" in honor of the U.S. Founding Father John Jay and his contributions to The Federalist Papers. Shortly into the 2016 season, NBC 7 San Diego lead sports reporter Derek Togerson popularized "The Federalist", which quickly became popular with Padres fans. Razzball.com originally started calling him The Federalist back in 2011. On January 28, 2011, Jon Jay hosted a charity bowling event at Lucky Strikes Lanes in Miami Beach, Florida. Called Jon Jay's Celebrity Bowling Challenge, an estimated $25,000 were accumulated throughout the almost four-hour event and went to Chapman Partnership, involved in homeless centers throughout the Miami-area. Jon and his family had been involved in charities just like Chapman Partnership throughout his childhood. Among the twenty Major League Baseball attendees were Yonder Alonso, J. P. Arencibia, Gio González, Drew Storen, Chris Marrero, Tyler Greene, Allen Craig, Lance Lynn, John Mayberry, Gaby Sánchez, Manny Machado, and Mike Lowell. Chris Bosh was also present. Jay married Nikki Stecich on November 2013. They welcomed twin girls during the offseason on December 1, 2016. In May 2014, Jay hosted another bowling event, this time with Allen Craig. They named it the Jay-Craig Celebrity Bowl and held it at the Flamingo Bowl in downtown St. Louis. The proceeds benefited Great Circle, a nonprofit organization that provides behavioral health services autism, educational challenges, emotional health, in-home crisis intervention, foster care and adoption, adventure therapy and psychological trauma recovery. In December 2015, Jay accompanied an expedition to Cuba with former Cardinals player and manager Joe Torre, and then-Cardinals catcher Brayan Peña. It was MLB's first visit there since 1999, and one anticipated as an important step to help normalize relations with the United States that had begun to ease earlier in the year.